We are pleased to announce that a Special Offer in November starts now. October 19, 2016 – Colasoft, an innovative provider of powerful and affordable network analysis and application performance analysis solutions, today announced the release of its flagship product Colasoft nChronos Network Performance Analysis Solution v5.2. 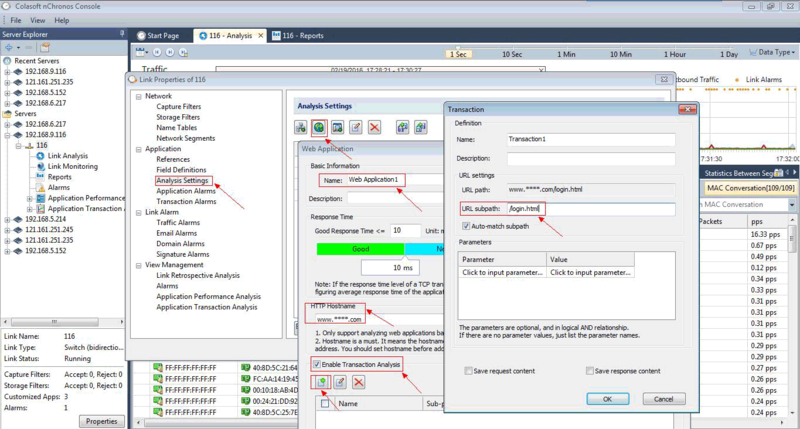 nChronos v5.2 comes with new types of alarms and adds TCP transaction analysis. August 23, 2016– Colasoft, a leading provider of innovative and affordable network analysis solutions, announces the release of a new version of Colasoft UPM today. With the release of Colasoft UPM V5.1, just by a glance, users can know network running status, business running status and whether there are alarms triggered. In addition to business monitor and analysis, UPM 5.1 provides direct traffic monitor and analysis, and automatic network performance analysis. Besides new features, this release brings a lot of improvements, which will help users a lot on both network performance analysis and application performance analysis. June 21, 2016 – Colasoft LLC, a leading provider of innovative and affordable network analysis solutions, today announced the availability of Colasoft Capsa Network Analyzer v9.0, a real-time portable network analyzer for wired and wireless network monitoring, bandwidth analysis, and intrusion detection. Together with the new release of Capsa, Colasoft MAC Scanner, Ping Tool, Packet Player and Packet Builder are all enhanced and released to the public. Colasoft MAC Scanner is a free network scanner software for Windows. It can scan all the ports of your local network for connected devices. It can provides you the details such as: IP Address, MAC Address, Host Name, Workgroup, and Manufacturer. It provides the details in tabular format, and you can easily export the data to txt or csv format. The program is helpful for Network Administrators to maintain a list of Network assets. You can easily check who is using your network. 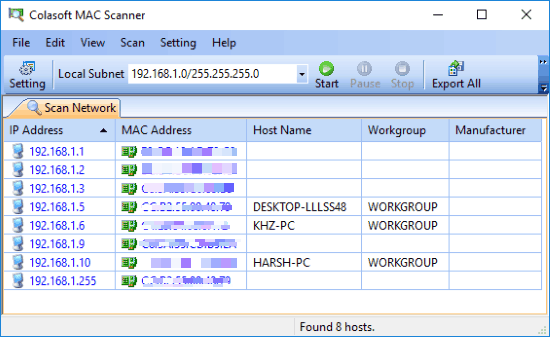 It is very easy to use this tool to scan the entire network, and find details of all the connected devices. You can click Start button on the main toolbar or press F5 key from your keyboard to start the scanning process. You can run it from Start Menu Run command also by typing “csmac” and pressing Enter key. It automatically detects all the Local Subnet list or you can click Refresh from the Local Subnet dropdown. 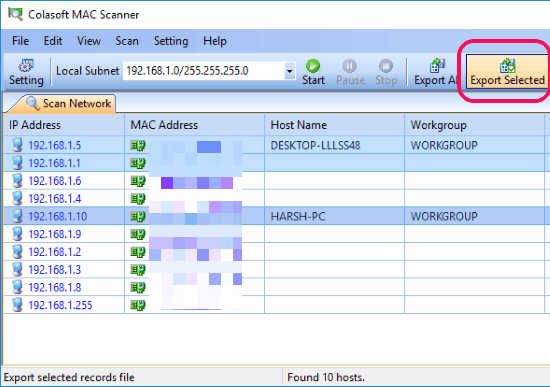 It takes just a few seconds to scan the entire network, and keeps showing details of the devices while scanning. Once the scanning is complete, you can export the list of connected devices. You can export the list in .TXT, or .CSV format, and also in its native .CSCNTAB (Colasoft Name Table File). The size of the program is just 6.79 MB and it can works with almost every Windows version. If you want to export only some records for later reference; you can do this too by selecting the records you want and click the Export Selected button on the main toolbar or use context menu command to do so. More commands like Copy, Delete, Find are also there in the Default toolbar and in the Edit menu. Also if the scanning process is taking much time, you can then Pause or Stop the process any time by pressing the desired button. Another interesting feature of this software is that it also lets you specify number of threads that can be used for scanning. You can choose between 1 to 100 threads. More the number of threads, faster will be the scanning performance. Despite being good at what it does, this software comes with its limitations and drawbacks as well. First of all, the documentation of this software talks about some features, which are actually not available in the free version. Secondly, I tested this software multiple times, but it never gave me the “Manufacturer” information. April 26, 2016 – Colasoft (www.colasoft.com), an innovative provider of powerful and affordable network analysis solutions, today announced the release of its flagship product Colasoft nChronos Network Performance Analysis Solution v5.1. With the packets of user-defined applications can be stored with truncated length now, the storage and retrieval performance are greatly improved. In addition, HTTP packets reconstruction and packets replay link are now available in nChronos 5.1, allowing network managers to easily monitor network activities and replay packets for abnormality diagnosis. Brute-force attacks are commonly known attack methods by which hackers try to getaccess to restricted accounts and data using an exhaustive list/database of usernamesand passwords. Brute-force attacks can be used, in theory, against almost any encrypted data. When it comes to user accounts (web based or system based), the first sign of a brute-force attack is when we see multiple attempts to login to an account, therefore allowing us to detect a brute-force attack by analyzing packets that contain such events. We’ll show you how Colasoft’s nChronos can be used to identify brute-force attacks, and obtain valuable information that can help discover the identity of the attacker plus more. For an attacker to obtain access to a user account on a website via brute force, he is required to use the site’s login page, causing an alarming amount of login attempts from his IP address. nChronos is capable of capturing such events and triggering a transaction alarm, warning system administrators of brute-force attacks and when the triggering condition was met. From the nChronos main page, first select the server/IP address we want to monitor from the Server Explorer section. Now click the button of New Web Application (second green button at the top) to set a Web Application, input Name and HTTP Hostname, then check the box labeled Enable Transaction Analysis and add a transaction with URL subpath e.g “/login.html”. Proactively monitor your network 24/7 for attacks, suspicious network traffic and problems – Download nChronos now! At this point we’ve created the necessary Transaction Analysis. All that’s required now is to create the Transaction Alarm. Finally, you can choose Send to email box or Send to SYSLOG to send the alarm notification. Once complete, the transaction alarm fordetecting brute-force attack is set. When the alarm triggering condition is met an email notification is sent. Note that the specific alarm triggering condition does not examine the amount of logins per IP address, which means the alarm condition will be met regardless if the 100 login attempts/min is from one or more individual IP addresses. This can be manually changed from theTransaction Analysis so that it shows the login attempt times of each individual IP address. The article shows how nChronos can be used to successfully detect a Brute-Force attack against any node on a network or evenwebsites, and at the same time alert system administrators or IT managers of the event. If you’re a network administrator, network engineer or IT manager, we strongly suggest you try out Colasoft nChronos today and see how easily you can troubleshoot network problems, proactively obtain alerts on unusual network traffic and monitor your network around the clock. 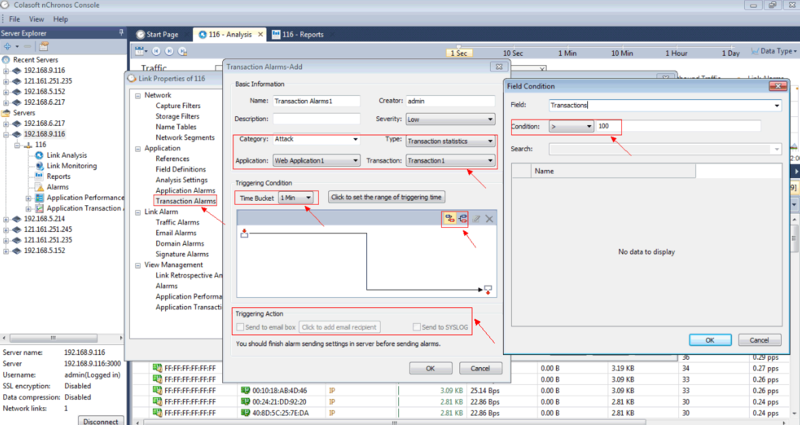 We are very pleased today to announce that a new version of Colasoft Capsa Network Analyzer, a real-time portable network analyzer for wired and wireless network monitoring, bandwidth analysis, and intrusion detection, is now available. The Windows 10 operating system logs off from time to time when starting Capsa. Added name table cannot be auto-saved. Packet files with capitalized extension cannot be replayed. Log View settings in Analysis Profile cannot be auto-saved. For wireless analysis, no packets are shown on the Packet view when a MAC address is selected in the Node Explorer.